Anyone that knows me knows that I LOVE encouraging kids and parents to get out and play more. Less screens, more sticks. Less sitting, more adventuring. Anything we can do to get the kids moving more is amazing! 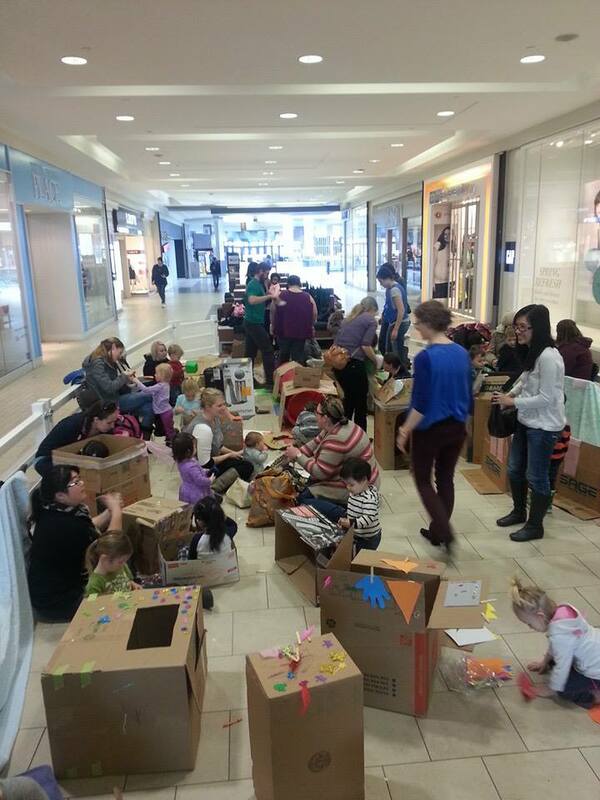 That is why I am so excited to have Project: Play come out to TWO events at Mill Woods Town Centre for Tot Time! On November 7th and December 5th from 10-Noon bring the kids to the mall for some free play activities! Kids will be able to play and create all morning. A cardboard box can be a spaceship, submarine or even a dinosaur like the one pictured below! "We provide a unique opportunity for children to build, create, enact, and play with the materials in whichever way they choose, safely, with the space we have created for and with them!" Founders Meghan and Anthony, have been Play Leaders since 2014. Working locally and internationally in the field of Play Work, they have been part of the University of Alberta's Play Around the World Program (who if you have older kids you will remember seeing at past events!) and assisting in the coordination of pop-up play events for the city of Edmonton. I am thrilled to have Project: Play out and I hope to see you at the mall!